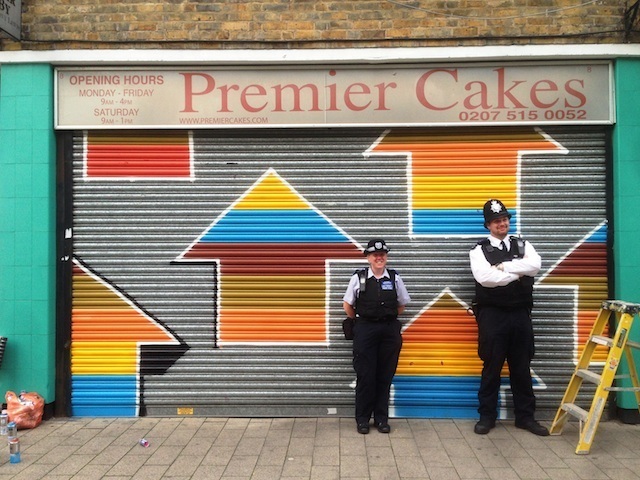 American street artist Above painted 46 shop shutters over 48 hours at Chrisp Street Market in Poplar this weekend. 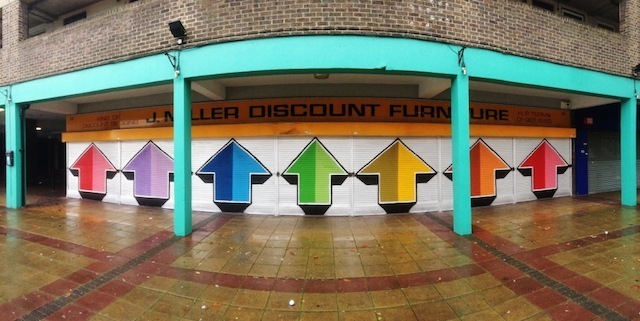 Using over 100 cans of spray paint, the artist — who prefers to keep his identity anonymous — covered 19 shops in the market with his signature arrow symbol, in a project jointly organised by London-based Global Street Art and housing association Poplar HARCA. "The idea came about after we were approached by Above, who wanted us to find shop shutters in London for him to paint," says Global Street Art CEO Lee Bofkin. "We spoke to Poplar HARCA as we knew it was looking for new ways to regenerate Chrisp Street Market. "We started the project with ten shops and 20 shutters, but as soon as we completed the first one, other shop keepers asked Above if he would paint theirs too. It was never intended to be so big, but we ended up with 46 shutters, covering 19 shops. "To the best of our extensive knowledge, this is the most shutters painted by a single artist (with a very small support crew) over a weekend. The market looks completely different but there is still much more to do, so a project is being planned for early next year."